Maryland wine has a reputation, not wholly undeserved, that is less than stellar. It is considered both unrefined and unfocused. There are several wineries with as many as 30 different wines and the focus seems to be on playful wine rather than “good” wine, especially as it relates to red wines. I believe this is the result of more than one factor. The first is the relative age of Maryland wineries (the oldest is Boordy which was established in 1945). Maryland has not had the time to experiment with what works and what doesn’t. The investment in vines can be substantial and they will bear fruit for anywhere from 35 to 50 years. Farmers and winemakers are not likely to tear out their investment until it has paid off. The second is simple; people buy them. I have been to several wineries that boast of their wines selling out in a few weeks. I taste these wines and I just don’t like them. They certainly don’t taste anything like the varietal they claim to be. From leftover Merlot with sugar added until it hits 9.5% residual sugar, to wine made with any fruit you can think of. They sell out. I can’t fault the wineries for following the money. To be clear, I am speaking of red wine here. Maryland white wine is quite good, and certainly worth exploring. I am especially fond of Maryland Pinot Gris. The green stem taste that is so uniquely Maryland and damages their reds, make Pinot Gris that much more crisp and refreshing. I can no longer make sweeping generalizations about Maryland wine. Black Ankle has challenged every statement I just made, and done so with a deftness that belies their youth. Black Ankle Vineyards is the realized dream of two Management Consultants, Ed Boyce and Sarah O’Herron. They decided to leave their corporate lives behind and see what adventures the world had to offer. They took their capital and traveled the world looking for inspiration. They finally decided to start a winery and decided they would do it right. 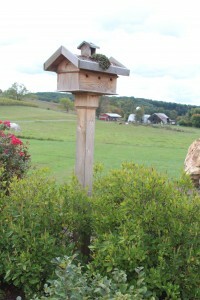 They are so Biodynamic even their birdhouse has a living roof. 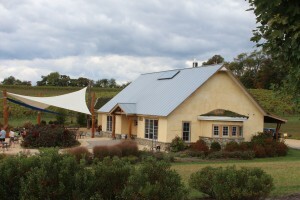 Most Maryland wineries are farms that just decided to start growing grapes and see what happened. Not so for this couple. Instead, they chose varietals that they loved from Bordeaux and searched for a place that would make them feel at home. In 2002, they purchased land from a farmer who warned them that the soil was so bad nothing would grow there. Sounds like the perfect vineyard soil to me. Soil samples agreed and they got to planting. 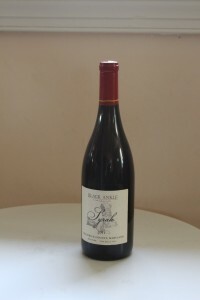 Their first vintage was in 2005, and their first bottles were released in 2008. They immediately began winning awards for their wines. They are continuing to expand their plantings and promise to continue improving the image of Maryland wine for the foreseeable future. 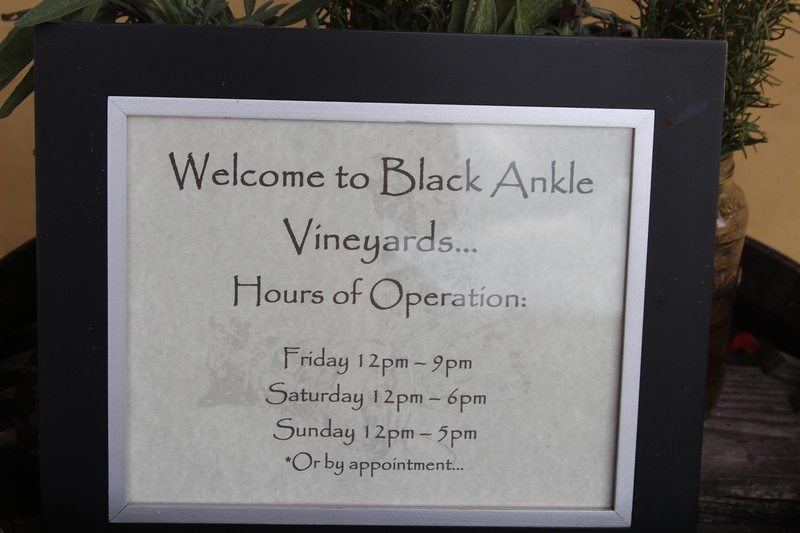 Black Ankle Vineyards is located on Black Ankle road. It is a winding back road about one and a half lanes wide and lined with trees on both sides. As you approach, the trees break and you see the rolling hills covered in neat rows of vines. plastered with a mix of soil and sand from their property. 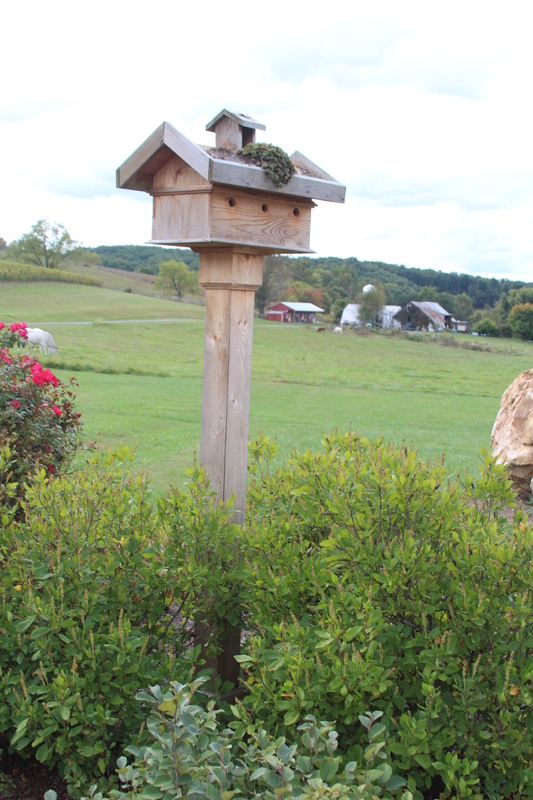 Other touches include a wood burning stove built from stones pulled from their land, and a living roof that helps both with insulation as well as rainwater management. As Cathy and I entered the very tastefully decorated tasting room, we were greeted at the bar (made of vines from their property encased in resin) by Karen. Karen was a slender woman in her middle years who claimed to have missed her calling as a sommelier. Looking at the tasting notes she writes for the winery, I have to agree. She was pouring four wines for tasting. Sadly their flagship wine Crumbling Rock was sold out and not available to taste. A moment of silence was observed for this disappointment, then we got down to business. The first wine was Passeggiata. It is a kitchen sink blend of everything they grow, all blended together then aged in oak. The wine was very bright, with strong raspberry flavors and a good acidity. The finish had more of the Maryland green stem flavor than I would like, but I suspect it would hold up well to food. Next I tried their 2011 Rolling Hills. Because of the exceptionally wet end of the 2011 growing season, they did not make a Crumbling Rock that year. Instead, the best juice from what would have been reserved for their flagship wine was instead added to their Rolling Hills. If this watered down version of Crumbling Rock is any indication, the real thing must be incredible. Flavors of cherry, blueberry and tobacco blend with a smooth finish that has lingering green stem. It is medium bodied, and actually tastes like a Merlot blend, something unique in my experience with Maryland Merlot. The next offering was the highlight of the day for me. 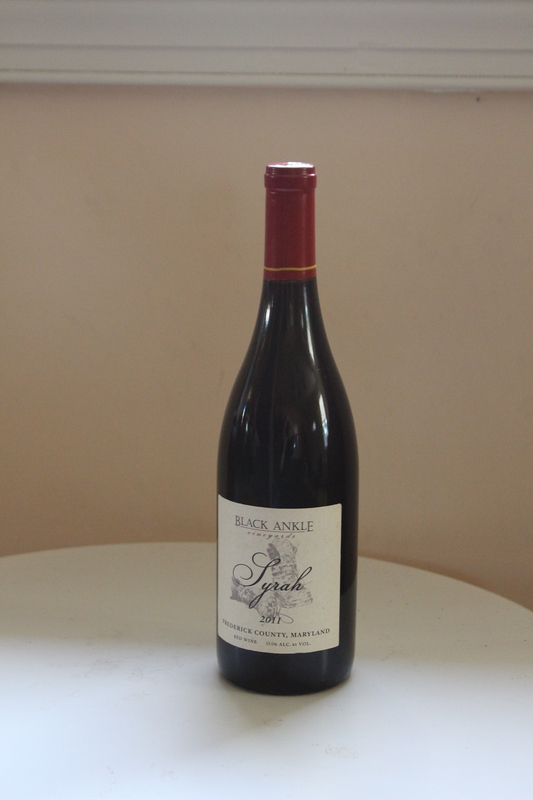 Their 2011 Syrah is 100% Syrah and tastes like it. The most exciting thing about the wine was the finish. As you can probably tell, I am not a fan of the Maryland green stem finish. I find it overpowering to the point of being a serious flaw in almost every red wine I have tasted in Maryland. Not so for this wine. It was there, but rather than being offensive, it was a reminder with each sip that this high quality wine was from Maryland. Rather than a flaw, it was a somewhereness, a Terroir. It was good enough that I was willing to pay $38 just so Mr.Dr. could have a taste of it at our next gathering. High praise from someone who winces at a $20 bottle. The final pour was their port style wine Terra Dulce III. It is another amalgamation of almost everything they grow fermented with grape grain alcohol to fortify it. It is a perfectly acceptable port style wine that would go beautifully with a stone fruit crumble and vanilla ice cream. At $45 a bottle however, I would rather pay a fraction more for a vintage port and age it myself. 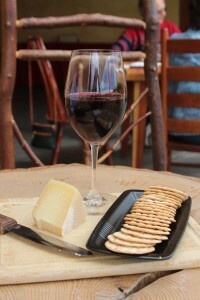 Tomae hard sheep’s cheese, water crackers, and a more than generous glass of Syrah. 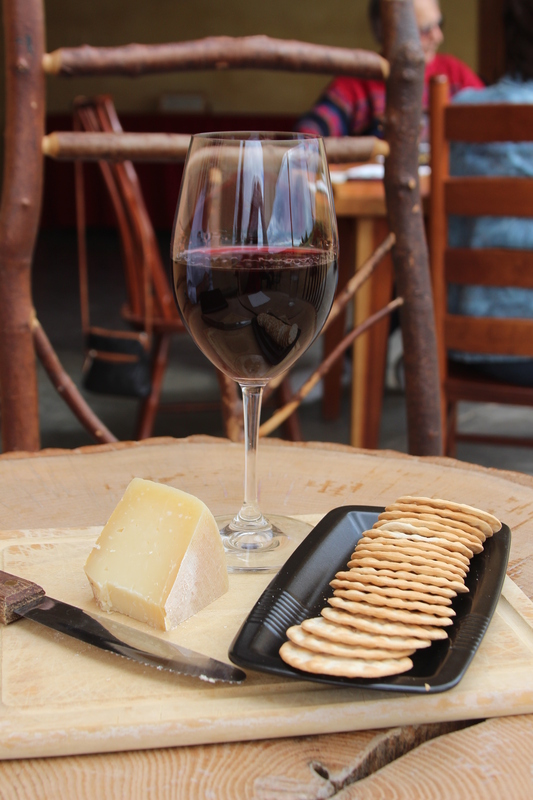 After the tasting, I purchased a glass of their Syrah, some Tomae hard sheep’s cheese, and water crackers and moved to a seat on their porch to wait for the tour to start. A beautiful day, beautiful wine, beautiful view, and beautiful wife made for an enjoyable light lunch. We finished just as the tour was starting. The tour was fairly typical of a winery and included many of the history details I included above. The one unique thing about this tour was the group of women taking it with us. As I understand it, they are a group of women from the University of Maryland who formed a wine group. They certainly showed a passion for wine, and spoke with me about wine and food in the area, suggesting I do a review of the restaurant Volt. As we were preparing to leave, I stopped by their table to say goodbye. The food they were pulling out of their coolers was impressive and would have been at home on any Tapas menu in Baltimore. They proclaimed they had taken my suggestion and bought a bottle of the Syrah. I was tempted to try and pull up a chair, but I was anxious to get to the next winery on my list for the day. In hind sight, I should have stayed to talk with the rambunctious wine loving women instead of disappointing myself by going to another winery. Any winery in the state is going to fair poorly when compared to the impressive work they are doing at Black Ankle. I can’t wait to see both what Black Ankle does in the future, as well as who is willing to follow in their footsteps and dedicate themselves to good wine done well in Maryland. 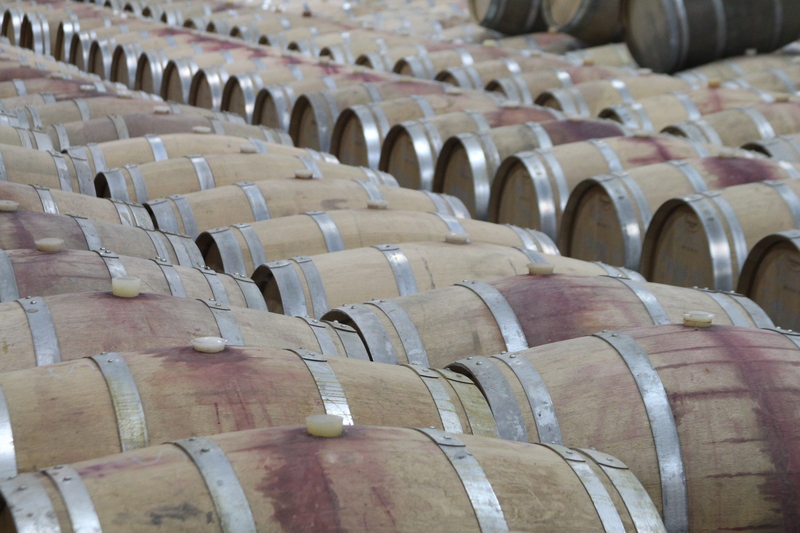 The French Oak Barrels at Black Ankle.